I completed my A-Levels quite a few years ago now, it's actually over a decade! I had kept my old canvas stored away all these years, always wanting to reuse them in some way. So here is my dirty secret...I did terribly at A Level art, which sounds ridiculous now as all I ever do is be creative. Below you can see my first 'recycled' canvas. It felt great painting lots of black paint all over my A Level work, sort of liberating even after all these years. This is the painting hanging on my bedroom wall. It's actually really hard to photograph. It seems much better in real. 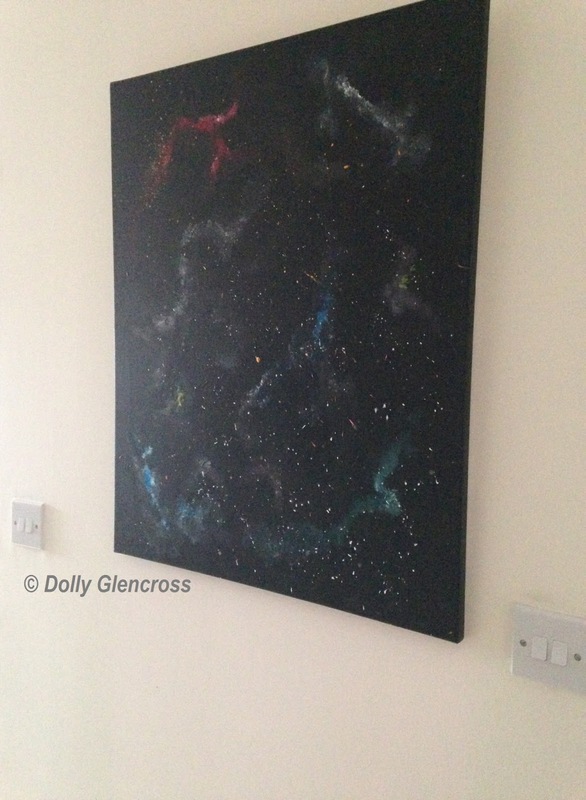 I tried flicking some glow in the dark paint on to the canvas which didn't seem to work very well. This might of been because I purchased the really cheap stuff from amazon. I don't know, but it just doesn't really show up at all.